"A Scotland favorite. 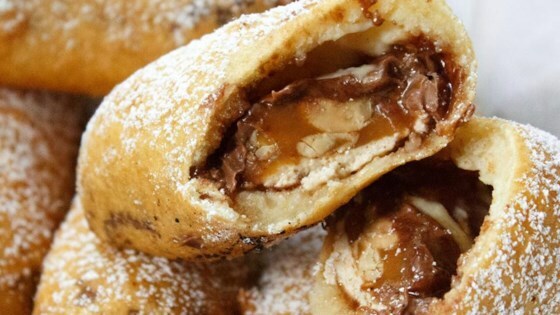 Deep-fried candy bars such as Milky Way®, Snickers®, Mars® Bars, etc. We like Snickers® the best. A real treat! This recipe is my own variation. Enjoy!" Mix all-purpose flour, corn flour, and baking soda in a shallow bowl. Stir enough milk into the flour mixture to make a somewhat-thin batter that will stick to the candy bars, but not drip off. Heat oil in a deep-fryer or deep skillet to 350 degrees F (175 degrees C). Dip the candy bars in the batter to coat. Carefully put coated candy bar into hot oil and fry until golden brown, 2 to 3 minutes. See how to make candy bars even yummier. The nutrition data for this recipe includes the full amount of the batter. The actual amount of the breading consumed will vary.